One of the biggest challenges in the history of mankind has been the development of a vaccine against the human immunodeficiency virus (HIV). This is even more so complicated by the fact that the genetic makeup of the virus undergoes tremendous variations. The advent of a very effective and safe vaccine is a far dream as of now when the vaccine development processes are traditional and in the research process. The need for the hour is the development of an effective vaccine against HIV. The challenges to it are manifold. Starting from the level where the basic pathogenesis of HIV infection poses a great riddle to the development of the effective vaccine, to the arena of a variety of socioeconomic challenges, political pressures and ethical considerations. The research into vaccine development has to be highly coordinated in the midst of all these considerations. This issue is an urgent mission, which demands that governments, policymakers and civil society have to work in unison with the scientists to tackle this huge challenge. Objectives: To observe correlation between parental and child reporting of change in asthma symptoms and objective parameters of lung function over time. Design: Prospective cohort study. Materials and Methods: Children (n = 125) were divided into two age groups (6-10 years and 11-15 years) and were classified into intermittent, mild persistent, and moderate persistent grades of severity. Parental and child reporting of quality of life (QoL) scores were recorded on a pretested questionnaire on the initial visit and at 4 and 8 weeks. At each session, appropriate counseling regarding the disease and its primary management at home was done. The change in scores from first and second follow-up visits was statistically correlated with changes in symptom score recorded on symptom diary, peak expiratory flow rates (PEFR), and spirometry. Results : There was significant improvement in the subjective and objective parameters compared at the two follow-up visits. The magnitude of improvement in parental global rating of QOL was similar to improvement in objective measures of pulmonary function in children 6-10 years of age, whereas both parental and child rating correlated well with objective parameters in children 11-15 years of age. Also, symptom score emerged as a stronger predictor of acute exacerbation in PEFR in candidate children who had breakthrough attacks. Conclusion: Improvement in QoL score is a sensitive measure of functional improvement in asthmatic children on treatment and may complement objective measurements. Health education has a positive impact on treatment outcome. Self monitoring of symptoms at home fosters more patient involvement and promotes better management at all levels of care. Objectives: The objective of the following study is to assess the quality-of-life (QOL) in children with asthma using the mini pediatric asthma quality-of-life questionnaire (mini PAQLQ) with treatment and from the caregiver's point of view using the pediatric asthma caregivers quality-of-life questionnaire (PACQLQ). Materials and Methods: Of the 75 children with asthma in the age group from 7 to 17 years of age, 69 were included in the study. The QOL was assessed using the mini PAQLQ and PACQLQ. 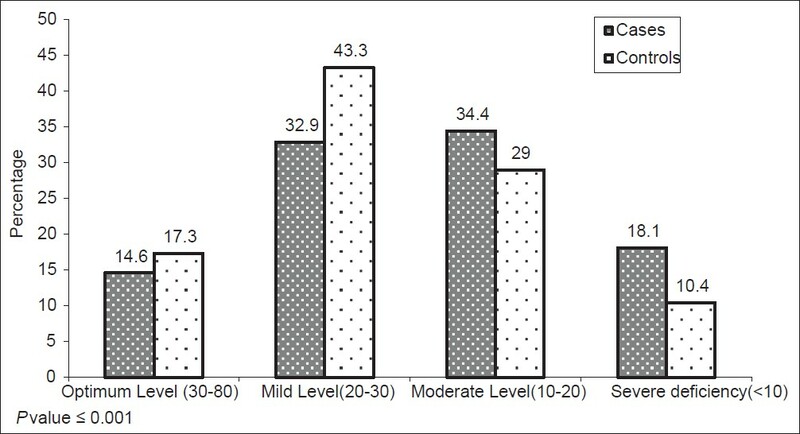 An asthma clinical severity score was also used to assess the clinical condition simultaneously. Results: On treatment, there was a significant change in the activity and symptom category of the mini PAQLQ (P < 0.001), but there was no significant change in the emotional domain of the mini PAQLQ even after medical intervention (P = 0.563). This indicates that although the activity level of children improved with significant symptomatic improvement, these children did not recover emotionally from the impact of the disease with medical intervention. 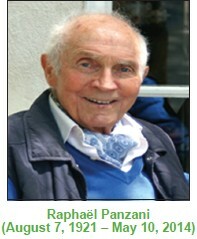 There was a significant change noted in both the activity and emotional domain of the PACQLQ with treatment. Conclusions: Although the children improved clinically with treatment there was no significant change in the emotional domain of mini PAQLQ. Inspite of there being a positive change in the groups after intervention, no statistically significant change was noted in the PAQLQ scores. Management of a child with asthma should not only include medical intervention but also psychological support and counseling. Background: Childhood asthma is common in children. It might be associated with behavioral abnormalities of inattention, irritability, or hyperactivity. These abnormalities form the major components of attention deficit hyperactivity disorder (ADHD). Allergic diseases and ADHD are common pediatric conditions associated with learning difficulties and sleep disturbances. There are conflicting research data regarding the association between ADHD and atopic disorders. Aim: The objective of this study was to examine the potential risk factors, especially investigate vitamin D deficiency a strong contributing factor in asthmatic children with ADHD. Design: This was a case-control study. Settings: Hamad General Hospital, Rumeilah Hospital, School Health and Primary Health Care Clinics, Qatar. Subjects and Methods: A total of 520 asthmatic children with ADHD and 520 controls aged 5-16 years old controls were enrolled in this study and matched with age and ethnicity. The study was conducted between June 2011 and September 2013. Data based questionnaire, clinical manifestations, family history, body mass index (BMI), and clinical biochemistry variables including serum 25(OH) vitamin D, calcium, phosphorus, magnesium was obtained. Univariate and multivariate statistical analyses were performed. Results: Severe vitamin D deficiency was significantly higher among asthmatic children with ADHD compared with the healthy controls (18.1% vs. 10.4%; P < 0.001). Furthermore, the proportion of overweight (24.1% vs. 18.1%) and obesity (8.2% vs. 5.4%) was significantly higher among asthmatic children with ADHD than healthy controls (P < 0.001). Mean values of vitamin D (17.25 ± 10.53 vs. 23.91 ± 9.82; P < 0.001), serum iron (81.46 ± 13.61 vs. 87.23 ± 12.46; P < 0.001), hemoglobin (11.68 ± 2.11 vs. 12.87 ± 2.15; P < 0.001), magnesium (0.77 ± 0.12 vs. 0.83 ± 0.13; P = 0.013), potassium (4.22 ± 0.53 vs. 4.58 ± 0.55; P < 0.001), phosphorous (1.53 ± 0.12 vs. 1.66 ± 0.14; P < 0.001) were significantly lower among asthmatic children with ADHD than in controls. There was a significant correlation between vitamin D deficiency and with age (r = −0.224, P = 0.001); calcium (r = 0.256, P = 0.001); phosphorous (r = 0.316, P = 0.001); magnesium (r = 0.288, P = 0.001); and BMI (r = 0.452, P = 0.001) in asthmatic with ADHD children. Vitamin D deficiency (odds ratio [OR] =3.27; P < 0.001), serum iron deficiency (OR = 2.81; P = 0.008), physical inactivity (OR = 2.67; P = 0.005), ferritin (OR = 2.53; P < 0.001) and serum calcium level (OR = 2.04; P < 0.001) were significant leading predictors in asthmatic children with ADHD. Conclusion: The present study revealed that vitamin D was a significant contributing factor in asthmatic children with ADHD followed by serum iron deficiency and physical inactivity compared with healthy controls. Aims: The aim of the following study is to determine the efficacy of single maintenance and rescue therapy (SMART) with adjustable dosing in management of persistent bronchial asthma. Settings and Design: It was a follow-up, prospective observational study over a period of 1 year in the pulmonary medicine department of a tertiary hospital. 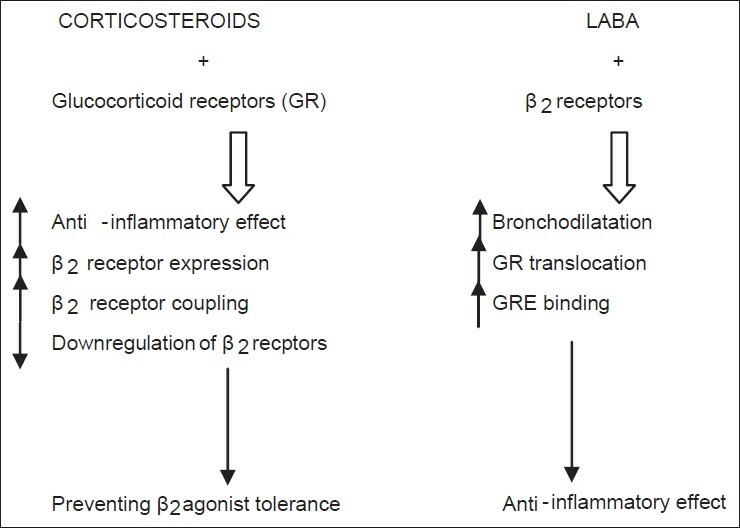 Subjects and Methods: Patients with newly diagnosed persistent bronchial asthma were started on a single inhaler containing budesonide/formoterol in a combination of 100 mcg/6 mcg in a dose of 4 puffs twice daily with as needed extra puffs (up to maximum 12 puffs/day) and were monitored for the subjective and objective control of asthma with parameters such as asthma control test score, forced expiratory volume in 1 s and peak expiratory flow rate in total 4 follow-up visits at 1 month, 3 months, 6 months and 1 year with step ping up or stepping down of the therapy according to the level of control of asthma. Statistical Analysis Used: The data was statistically analyzed by t-test using SPSS 14 software. Results: Guideline-defined asthma control could be achieved in 34 of the 40 patients and they could be successfully stepped down. Only 3 out of the 40 patients had acute exacerbations all of which were mild. They were managed by stepping up of the therapy. In another three patients stepping down was not possible due to persistence of partially controlled asthma. There was overall improved compliance on the part of the patients. Conclusions: SMART therapy is effective in the treatment of bronchial asthma in our kind of set-up. Only in future, similar studies need to be done with a larger sample size. Background: Allergic rhinitis (AR) is the most common type of chronic rhinitis, affecting 10-20% of the population. Severe AR has been associated with significant impairments in quality of life, sleep, and work performance. A role for vitamin D in the regulation of immune function was first proposed after the identification of vitamin D receptors in lymphocytes. It has since been recognized that the active form of vitamin D, 1α, 25(OH) 2D3, has direct affects on naïve and activated helper T-cells, regulatory T-cells, activated B-cells and dendritic cells. There is a growing researches linking vitamin D (serum 25(OH) D, oral intake and surrogate indicators such as latitude) to various immune-related conditions, including allergy, although the pattern of this relationship is still yet to establish. Such effects of vitamin D can significantly affect the outcome of allergic responses like in AR. Aims and Objectives: To evaluate nasal symptom scores in patients of AR, pre- and post-treatment with and without supplementation of vitamin D. Materials and Methods: Vitamin D levels were assessed in 21 patients with AR diagnosed clinically and evaluated prospectively during the period of 1 year. Pre- and post-treatment vitamin D3 serum levels measured and documented. They received oral vitamin D (chole-calciferol; 1000 IU) for a given period. The results were compared with the patients having AR - treated conventionally without supplementation of vitamin D. Results: Improvement in the levels of serum vitamin D levels were significant in post-treatment patients (P = 0.0104). As well as clinical improvement in terms of reduction in the total nasal symptom score was also significant in the post-treatment patients (P < 0.05). Conclusion: Supplementation of vitamin D in such patients alters natural course of AR toward significant clinical improvement. Background: Upon exposure, allergic reactions to breathing pigeon feces are common. The dust of dried droppings irritates the nasal passages, causing sneezing, coughs, excess mucus and shortness of breath, dizziness and a sense of vertigo. Hence exposure to pigeon allergens in the surroundings has led to increase in hypersensitivity reactions due to pigeon proteins present in their feathers and droppings. Aims and Objectives: The aim and objective of the following study is to investigate the role of pigeon droppings in the increase of inner city asthma. To study the different allergens present in the pigeon droppings. Materials and Methods: A total of 500 asthmatics were screened for hypersensitivity reactions toward protein extracts from pigeon droppings. 100 asthmatic patients were selected showing 3+ reactions by skin scratch test and an induration of more than 5 mm with inflammation. 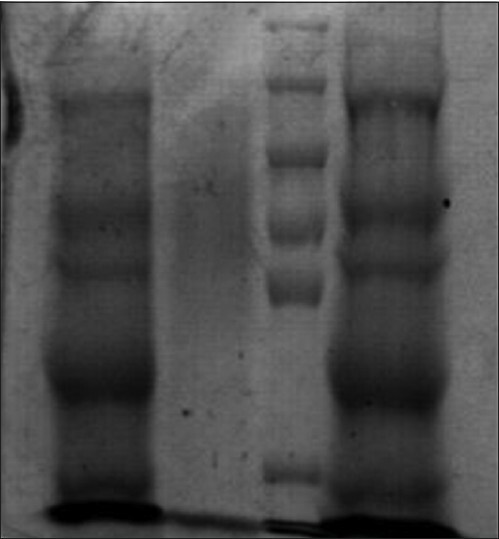 Total immunoglobulin E (IgE) as well as specific IgE quantitated by enzyme-linked immunosorbent assay (ELISA) and circulating immunoglobulin G (IgG) antibody toward pigeon allergens was studied by western blot. Results: Totally 87 asthmatic patients and 23 healthy normal showed reactivity toward allergens of pigeon feathers and droppings by skin test with induration of 1.48 ± 0.12** in patients (P < 0.000) and 0.17 ± 0.81 in healthy controls. Reactivity shown toward pigeon dropping allergen was 13 ± 0.121 in patients and that shown by healthy controls being 0.26 ± 0.094*(P < 0.001), which was also statistically significant. The total IgE was 1906.84 ± 3696.27 IU/ml in patients **(P < 0.0001) when compared to healthy controls 86.21 ± 50.18 IU/ml. Specific IgE detected in patients toward allergens was 0.31 ± 0.10 OD. *(P < 0.001) to that of normal being 0.19 ± 0.06 OD. Patients serum reacted to 129 kD and 43 kD protein extract of pigeon dropping by western blotting and total IgG by ELISA was 1802.0 ± 66.5 mg/dl in patients (P < 0.016). The normal range being 581-1630 mg/dl. The pulmonary function test by spirometry was 60%, 40% lesser when compared with healthy normals. 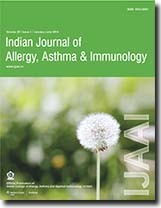 Conclusions: Observed results showed an increase in the hypersensitivity reactions toward the pigeon allergens and increase in the antibody levels of IgG in circulation. This probably may have added to the increase in asthma cases in our city. Allergic disease induced by animal exposure is a well-known fact. Exposure to dander of pets such as cats and dogs can lead to allergic manifestations of allergic rhinitis, allergic asthma, and contact urticaria is a well-recognized fact. Allergy to horses can also present with all these symptoms as well as anaphylaxis in the subjects who are previously sensitized. Horse allergy is induced by exposure to the major horse allergens Equ 1 through five with the level of exposure determining the level of severity. Greatest risk of anaphylaxis occurs in those sensitized patients who have large amounts of animal allergen exposure, with maximum chances with animal bite as it exposes the sensitized persons to large quantities of the animal allergen that resides in the saliva. Horse allergy may be successfully treated with allergen specific immunotherapy. Adverse drug reactions continue to be among the important cause of morbidity and at times mortality among hospital admissions. 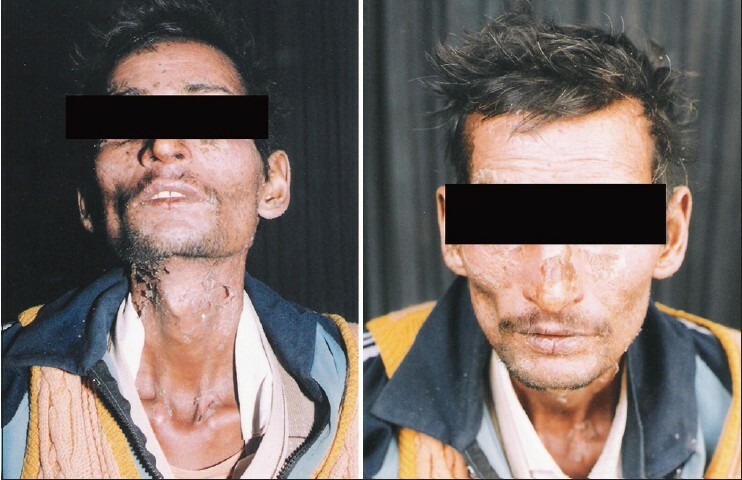 The severity of cutaneous adverse drug reaction may vary from mild rashes to severe Stevens Johnson syndrome (SJS). Nevirapine (NVP) is an important component of antiretroviral therapy for patients having acquired immunodeficiency syndrome. It usually cause mild rash in some of these patients. This report describes a case of NVP induced SJS that was reversible on withdrawal of the drug. Possible mechanisms of NVP induced SJS and its clinical implications are also briefly discussed.